The American flag represents a symbol of freedom in the American culture. The flag should never touch the ground and should be handled respectfully. The Spanish version of this wordless book shows the construction of the flag to its use. Early learners will be encouraged to learn about the importance of the American flag by determining the meaning behind each photograph. 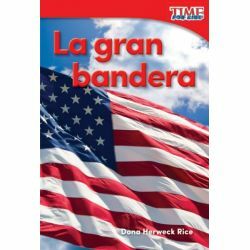 Aligned to the National Council for the Social Studies and other state standards, this book is a great tool for teaching young students about our symbol of freedom.